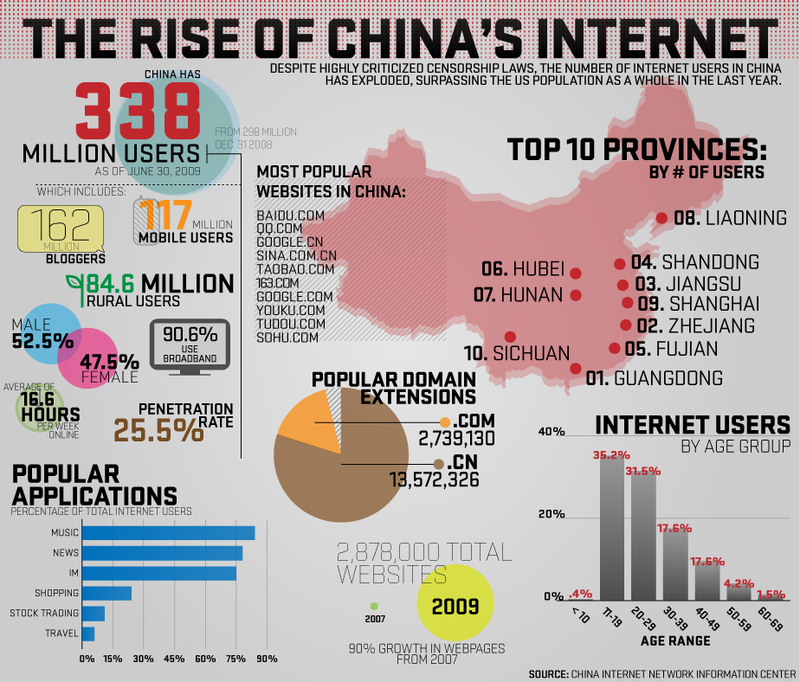 Investment in telecommunications & information technology will prevent the economic collapse of the modern Chinese state. George Friedman, stratfor founder, has long argued that China is doomed in the long run due to the wealth disparity between the coastal region and the interior. He believes this wealth disparity will lead to political instability and the collapse of China. His argument: The cost of transporting goods determines how wealthy a region can be, coastal regions on ocean trade routes can be rich while internal regions with no river transportation network will be poor (water is the most cost effective way of transporting goods). He sees the growing wealth disparity leading to political instability (as it has in the past) which can only be resolved with a Maoist type equalisation of wealth, In Mao's case he made everyone equally poor with his bad policies but maintained China's political integrity against western encroachment. I think Friedman's argument may have overlooked information networks. The internet is a very low cost way of transporting information, furthermore the percentage of GDP which is made up of information goods and services is increasing and will continue to increase. I think the consumption of information goods and services will reach a point where it accounts for over 80% of GDP in the next 20-30 years. I can't back this up with hard facts and this prediction is reliant on an exponential growth in information technology as postulated by Vernor Vinge (accelerating change) and Ray Kurzweil (law of accelerating returns). These predictions are both to a large part based of Moore's law. My basic argument would be, with the exponential growth in computing power, the proportion of GDP that would be made up of information goods will increase. China will have 1.3 billion people all speaking the same language as their 'base network' for information creation and propagation, giving them the critical mass to compete with the English speaking west. Metcalfe's law states that the value of a telecommunications network is proportional to the square of the number of connected users of the system meaning the number of human minds generating information on China.Net will become the primary measure of economic strength. In this case, provided China has a solid internet infrastructure, the quality of life of its inland citizens should not be that much worse than those in the coastal regions. It will be worse in terms of the consumption of tangible goods, but the information goods and services should help alleviate this (at least enough to prevent political upheaval). 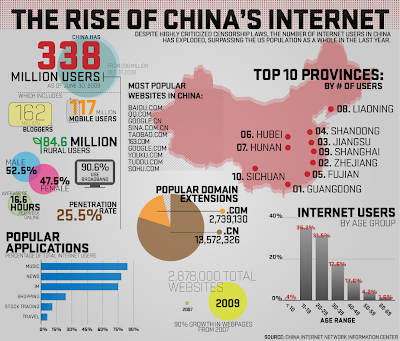 China invested a total of 4.3 trillion yuan (630 billion U.S. dollars) in Internet infrastructure construction from 1997 to 2009 (see here), By the end of 2009 the number of netizens in China had reached 384 million, 618 times that of 1997 with an annual increase of 31.95 million users. Furthermore the Chinese white paper on internet policy issued last year states China intends to make the internet accessible to 45% of its population by 2015. 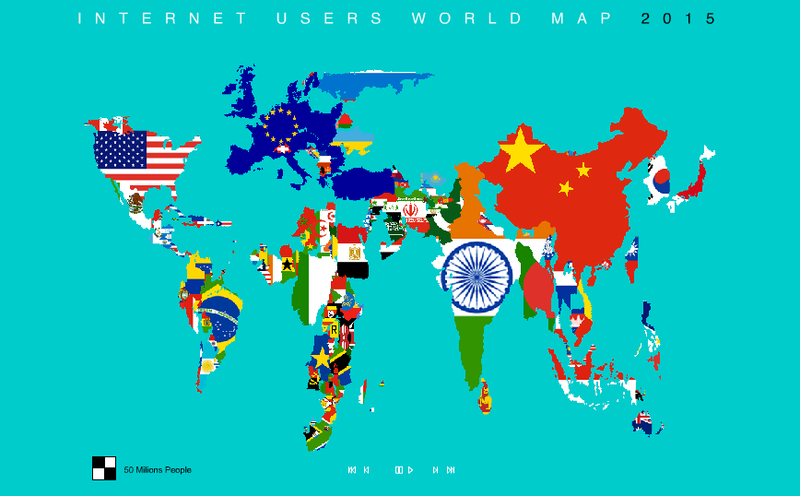 As you can see, provided English continues its colonization of the European Union, West.Net and China.Net will have approximately the same number of people interacting in the same language. A side question: will India.Net be dominated by English or Hindi?